Super Bowl: Did the Commercials Beat the Game? Did you see that catch (or non-catch, apparently) by the Panthers’ Jericho Cotchery or Cam Netwon’s fumble, which resulted in a touchdown for the Broncos? Or how about after the game, when Broncos defensive back Aqib Talib was a bit too excited to join the NFL Network booth? Well… if you are anything like me, then you didn’t. Also, if you’re anything like me, the only reason you watched the game was for the commercials…and the half time show. As the most-watched live TV event, it’s no surprise that brands shell out millions of dollars to get less than a minute of airtime. This year was no different as the price of a 30-second spot was at a record high – $5 million. Everyone remembers last year’s controversial ‘Dead Kid’ commercial, which was a PSA on preventable accidents and childhood deaths. Nationwide got a beating on social media as many found the ad to be insensitive, especially for those who’ve lost a child. From beer to car ads, the big game’s commercials have traditionally been aimed at the consumer. Not anymore! This year Adobe Marketing Cloud got in the mix with its humorous “The Gambler” commercial, proving that technology has crossed over into the American mainstream – even outside Silicon Valley. Wearables are everywhere and this year’s big game was no different. In Hyundai’s commercial, comedian Kevin Hart plays a dad who uses his Hyundai’s Car Finder Apple Watch app to keep a watchful eye on his daughter on her first date. In case you missed this year’s commercials, don’t worry you can still watch all of them when they rerun a million times across all the TV networks. You can also just watch them here. *Special thanks to Chris Navalta and Neil Torres for providing their game time insight or I wouldn’t have been able to write the introduction to this post!! The butterfly effect. Yes, it’s a movie starring Ashton Kutcher but what I’m really talking about is how a single action, no matter how small, can have larger, more drastic (even detrimental) effects on a bigger event. One commonly used example: a butterfly flaps its wings in Brazil, dramatically altering the course of a tornado in Texas. Today, a number of small events have generated larger-than-expected outcomes, primarily because of the Internet. The Internet is the ultimate catalyst for this phenomenon, which we’ve now seen play out in the media over and over again. Events that may have flown under the radar in the past are now center stage. Alaska Airlines recently booted a woman off a plane traveling from Hawaii to California because she had cancer and appeared ill, but didn’t have a note from her doctor allowing her to fly. Seriously? In their defense, they were following a (probably flawed) protocol and probably didn’t realize how this small event would blow up and get national attention. But it did, and the brand paid the price for what happened on one of its many flights on a global scale. Alaska Airlines was quick to issue an apology and offer a full refund, but the damage was done. The woman missed a chemotherapy appointment and the airline’s reputation was tarnished. In this case, the butterfly effect triggered a negative outcome, but that doesn’t always have to be the case. You may remember the hullabaloo last month over the questionable color of a dress. After the image hit Tumblr, the debate over the dress’ real color exploded all over the Internet. It was covered by numerous leading news sites, and even celebrities joined the online debate. Is it black and blue, or white and gold? Seriously, who cares? Apparently, everyone and their mothers. This is a perfect example of how one small thing – in this case, an oversaturated photograph of a striped dress – can get national attention. Not your usual example of the butterfly effect, but nonetheless an example of a small event exploding into absurd proportions and becoming a bigger issue than expected. Good or bad – we see the butterfly effect phenomenon play out in the media on a daily basis. One thing is certain though, hope that your brand doesn’t find itself in a situation like that of Alaska Airlines. 2014 was a great year for social media as big brands started to take online conversations seriously. Just look at the Superbowl, where a record number of ads were accompanied by the now almost obligatory hashtag. As with any relatively new area, mistakes will happen. And that was certainly the case in 2014 as social media continued its march to the mainstream. As a company that runs a lot of social media campaigns, we certainly don’t want to tempt fate, but we did think it would be good to look back at some of the biggest blunders and see what we can learn. Okay, maybe we did have a laugh or two as well, but if you read this blog regularly, you already knew that. Thousands of women took to Twitter to speak out about domestic violence using the #WhyIStayed hashtag after the suspension of NFL player Ray Rice for beating his wife. DiGiornio also joined the conversation – regrettably. Lesson Learned: Take a minute – even a few – to do your due diligence and research a hashtag before joining the conversation. This is a mistake that could have easily been avoided if they had taken the time to understand its context. 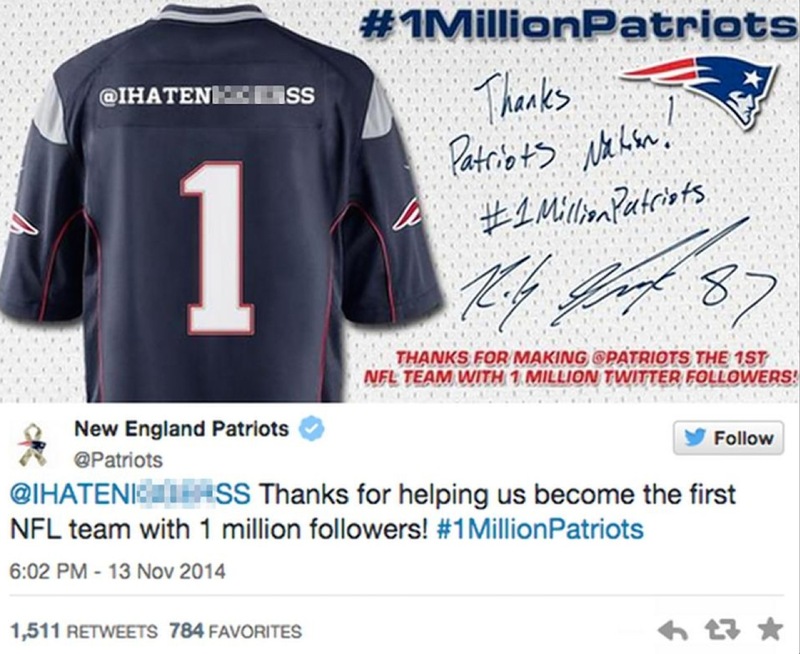 To celebrate the NFL team’s one million followers, the New England Patriots asked people to retweet an image of the Patriots jersey with a chance to get their handle written on the back. Unfortunately, the process was automated and the lucky one-millionth follower featured a racial slur in their Twitter handle. After realizing the mistake, the team deleted the tweet and responded with an apology, claiming their filtering system had failed. Lesson Learned: Be wary of over-automating your processes. If you do have automated programs, make sure you have adequate checks and balances in place. It may take more time and resources, but you should always take a personalized and human approach to social media. 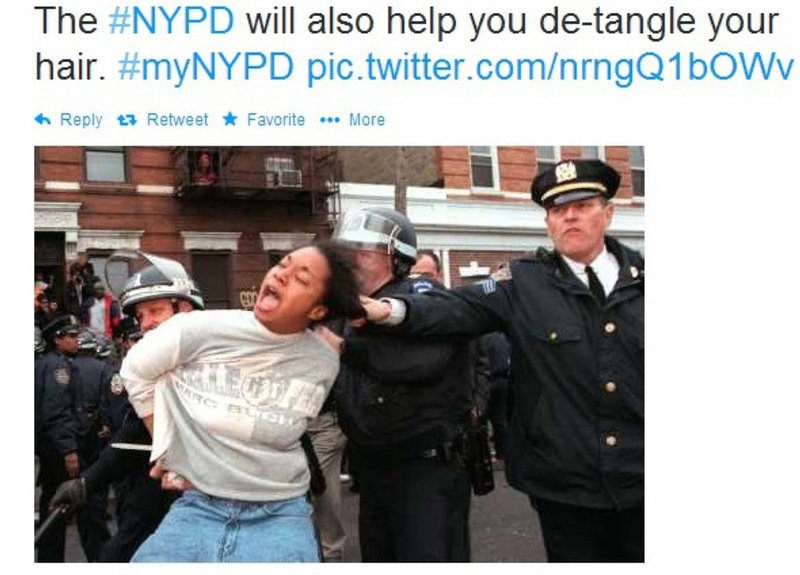 Earlier this year a New York Police Department social media campaign backfired when they asked followers to post pictures of themselves with police offers using the #MyNYPD hashtag. Instead of receiving police-friendly photos, they received a slew of photos that depicted officers abusing their power, like wrestling protestors and pointing weapons at civilians. Lesson Learned: Brands should think through and analyze the possible outcomes of a social media campaign – the good, the bad and the ugly. If there’s a high chance of social media backfire, then you should probably pass on the campaign. U.S. Airways got red in the face when one of its employees accidentally responded to a tweet with a pornographic image attached. As you can imagine, this social media faux pas got a lot of laughs (but not from U.S. Airways). U.S. Airways quickly apologized for the tweet and said it was investigating the matter. Luckily, the U.S. Airways employee wasn’t fired for their mishap. Lesson Learned: It’s always a good idea to get a second pair of eyes on your content. Someone else may notice a typo or mistake that you didn’t. By taking a few extra minutes to review your tweets, you can save yourself from a year’s worth of embarrassment. Every company has made mistakes on social media – it’s inevitable. Some have just made bigger mistakes than others, resulting in PR fiascos and brand meltdowns with huge economic consequences. Hopefully, we can learn from each other’s mistakes and avoid social media fails like these in 2015. Let’s make it a New Year’s resolution?